If you’ve read this blog for a while you may know how rare it is that I am unstintingly positive about anywhere – what can I say, I’m a discerning (*picky/fussy call it what you will) kinda gal. That said, one of the few places I adored without limitation last year was Flesh & Buns. I was therefore pretty excited when I heard about Flesh & Buns owner Bone Daddies opening a pop up place on Old Compton Street. The term “pop up” has a rather ambigous meaning these days. When the term first, well- popped up, it meant somewhere opening for just a few days or weeks. Then the phrase became a bit overused so when Jamie Oliver announced his “pop up” Jamie’s Diner in Piccadilly Circus – still marketing itself as “for a limited time only’- eyes rolled, especially when it was uncovered that the lease was for a minimum of three years so hardly what most people consider “pop up”. In the case of 14a Old Compton Street it seems that the lease is for an initial year so its not yet a permanent fixture but also isn’t going to be one of those places that by the time I’ve pulled my finger out and written about it you can’t go because its already upped sticks and left. Due to its not-sure-if-its-permanent status its also not had a high gloss makeover so is charmingly rustic with the previous inhabitant’s brick pizza oven still very much mid restaurant (and in use). 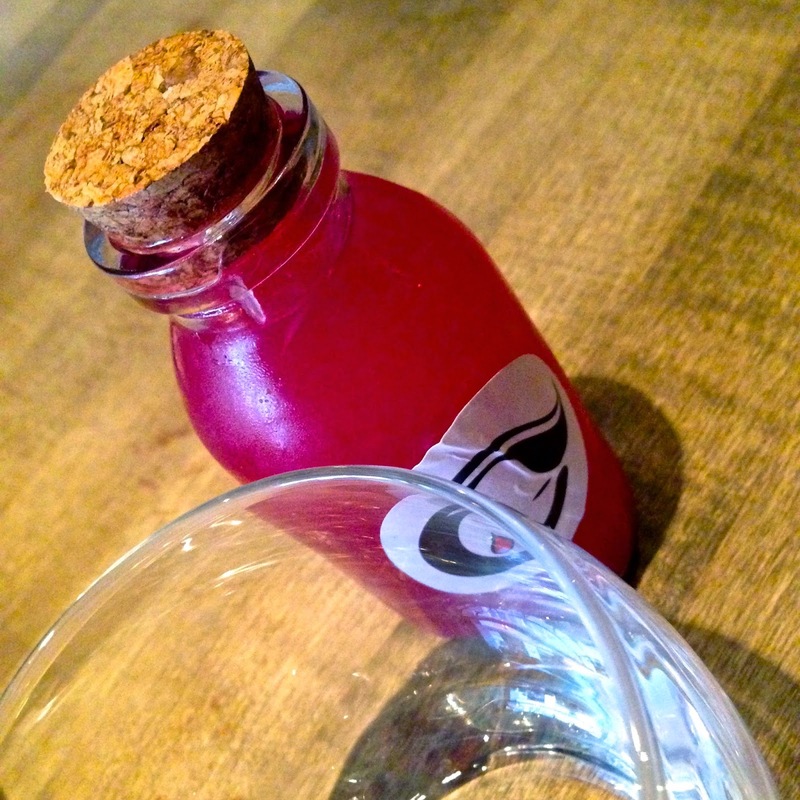 Its is suited to casual dining with your mates rather than first date territory but none the poorer for it. It also gets pretty smoky in there from the oven so don’t be going on to anywhere you need to smell nice. I’m still allergic to queuing so we had planned afternoon tea at Dean Street Townhouse for a lazy Sunday afternoon but when our table still wasnt ready 15 minutes after the booked time I went in search of Shackfuyu. Its one thing to queue when its ‘no reservations’ but quite another level of annoyance again to queue when you had bothered to book. Back to Shackfuyu… Not a single person queuing and a haven of peace and calm inside with a lovely warm smiley welcome- job done! 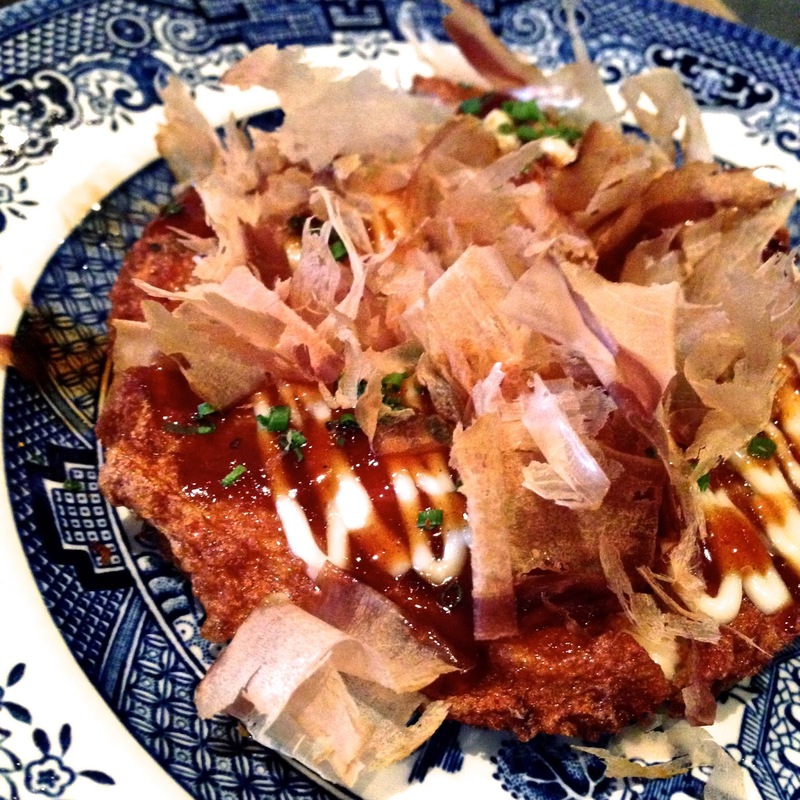 “Prawn toast masquerading as okonomiyaki” was just that; a circular slab of minced prawn fried patty but topped with spring onion, creamy sauce and the faintest whisps of bonito flakes that fluttered and danced in the air just like Hiroshima’s favourite snack. This was nothing like your stereotypical Chinese takeway prawn toast though. No fried bread and not overly greasy; a soft, well seasoned prawn filling and the lightest of coatings. 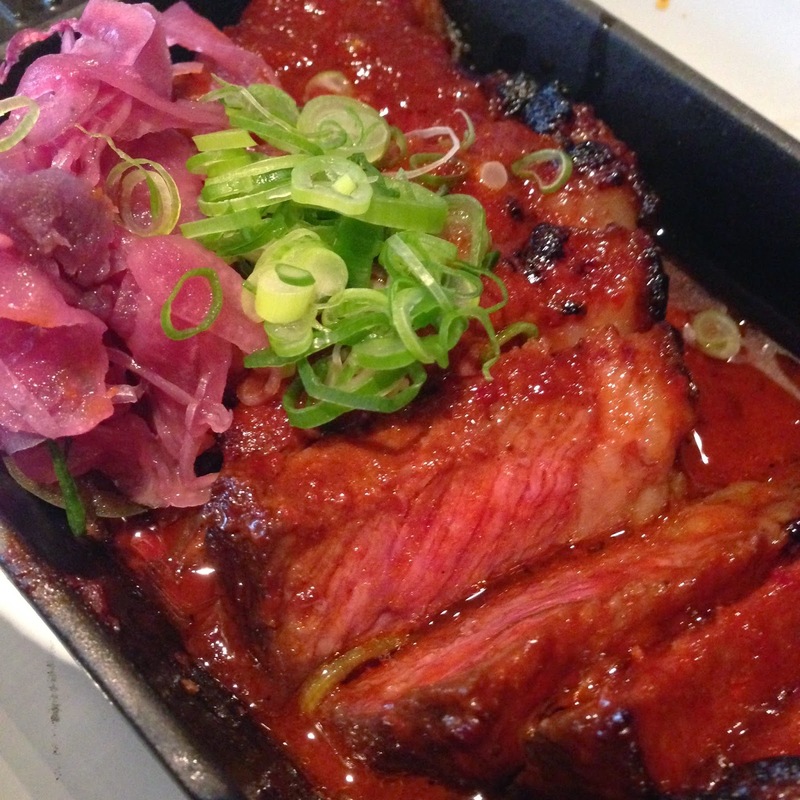 My highlight beyond compare was the beef picanha with kimchee tare butter. Or an alternative description would be just really tender, rare beef slices dripping in savoury salty butter. Let’s go with that. As with Jinjuu, the meat is listed in the dish description as being USDA. Yes, I know its good meat, my mouth told me that, but its a long way to bring cow when we have very good ones here too thank you very much. Its apparently almost illegal to go to any Asian fusion type place in Soho at the moment and not order Korean fried chicken so we jumped on board. Sticky enough to require copious finger licking with sharp tang that gives way to a blast of chilli and spice- they are not for the faint hearted. Being brutal, the wings aren’t quite as good as those at Jinjuu (mainly down to their incredible sauce) but they are still delicious so I certainly wouldn’t hold back on ordering them again. The Mentaiko Mac & Cheese got full marks for quality of sauce- thick and creamy- but I’m not sure about the mentaiko ball served on top. It was suggested that we stir it into the sauce but having tasted a small mouthful of cold pollock roe we decided to go more traditional and keep fish and cheese well apart. 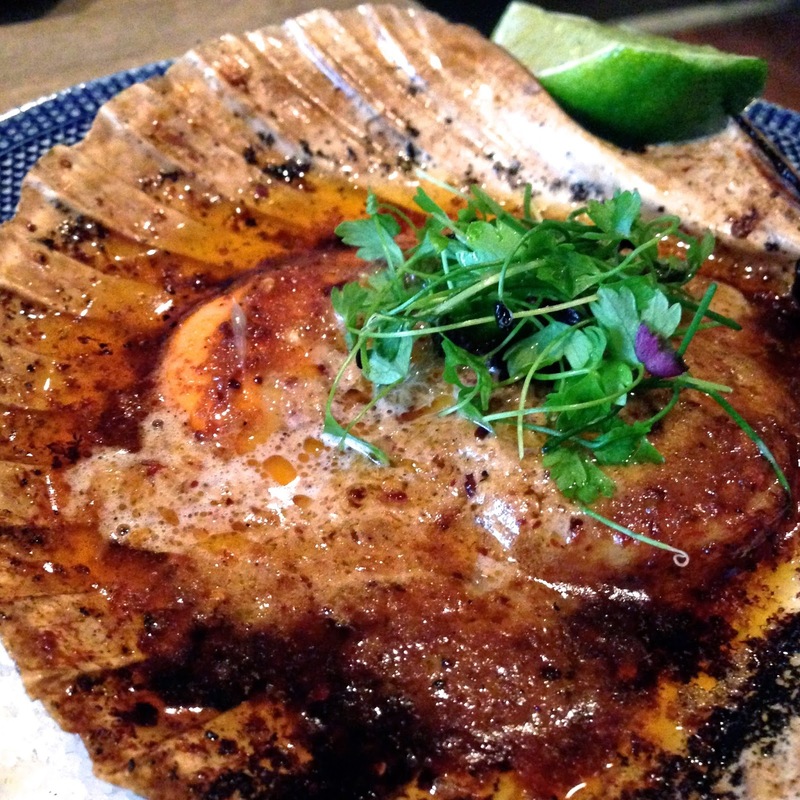 Scallop with chilli miso butter might sound pricey in the singular at £8 but our portion contained two scallops and a plump roe so kept me happy if not my scales. Swimming in a deeply savoury butter (albeit with less chilli then the name might suggest), the molten pool gave way to a springy but delicate opalescent flesh. The hot stone rice comes in a big cast iron bowl with gome tare, chilli and beef along with various veggies like shredded carrot and roast sweetcorn. It is then mixed together at the table so that the heat of the bowl cooks the egg through the rice. Don’t just take my word for it though, my first attempt at a gif below will hopefully prove it. 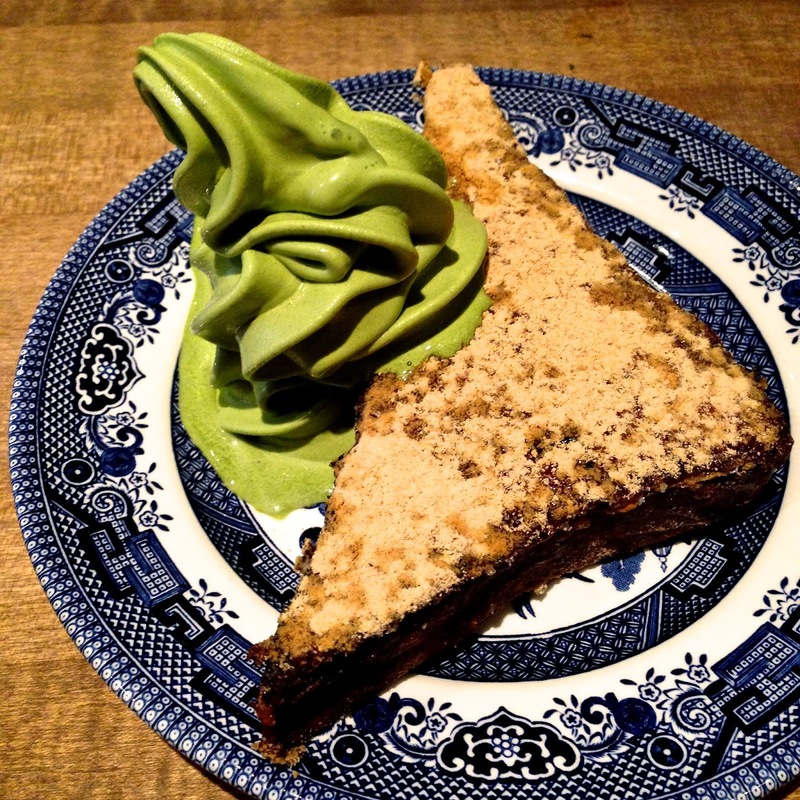 Kinako french toast with matcha Mr Whippy is the only dessert on the menu and has been a much instagrammed and talked about dish. I think its worth all the praise it gets. Although firm on the outside, the caramelised, kinako-covered crust gives way to a sweet, soft inner. L wasn’t so sure about the ice cream but I know that the not-quite-sweet and a bit powdery flavour of matcha can be an acquired taste. Highlight: Its between the French toast and the beef. I can’t decide. Am I allowed one sweet and one savoury highlight? Oh, I make the rules here so yes! Have both. In summary: Another Eastern fusion riff on the Bone Daddies/ Flesh & Buns concept but so nice and different enough that you don’t care.